Concrete slab is ready for cinderblock. The other day my phone rang and it was a customer of Backyard Flare that had purchased a DIY construction plan for the Pima II design. 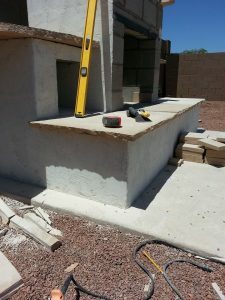 This customer was looking for information about whether he needed to build the fireplace on a concrete pad or whether he could just build it on the dirt. This question comes in quite often so I wanted to address it again. 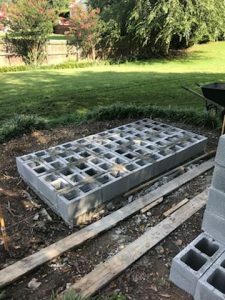 Concrete pads are necessary for a masonry outdoor fireplace. Think about all the places you have been and the ground you have walked on. There’s Arizona with ground so hard that it almost takes a jack hammer to dig down a couple inches. Then there’s Florida with gorgeous sandy beaches, but that sandy soil reaches inland too. You have the northeast states that have frost lines so deep, that it’s a wonder that it ever thaws out. And we can’t forget the northwest that gets a lot of rain that could create washout conditions. There is our dilemma with phone calls relating to how thick or whether a concrete pad is necessary. Even here in Arizona, I always build my outdoor structures on concrete. This is for peace of mind so if there is any ground settling, the structure will hopefully be okay. If a masonry built structure settles, and it has been built on a running bond (stair step) block pattern, the cracking will look like a stair step going up. The blocks will often separate at the seams, not crack. This is not the way you want your outdoor structure to end up, because you spent your hard labor to build it. DIY outdoor fireplace on new poured concrete pad. Do it right from the beginning and pour some concrete. Support that structure and keep it from settling and cracking. Now you say, that’s all fine and dandy, but how thick does the concrete need to be? There’s an issue with that portion of the concrete pad question in that there is no “one answer” to that question. There is no recommendation that we can give you because your geographic area and soil will dictate the answer. Remember all the different soil types we cited a few paragraphs ago? There are so many variables that exist that will need to be addressed and recognized before a concrete pad thickness answer can be formulated. Our advice is to seek out some professionals in the concrete industry and ask. Go to Home Depot or Lowes and see if there is a person who used to pour concrete for a living that is working there in retirement. They are sometimes a wealth of information. Go to the internet and search for recommendations based on your soil type and geographic area. Again, lots of information. So, what have we learned? I always recommend a concrete pad for an outdoor masonry built fireplace or kitchen. There is no hard and fast recipe that applies to everyone that they should follow to pour the pad, so go find your local resources. They’re out there. 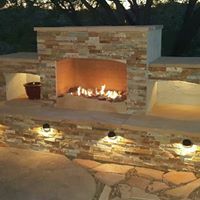 If you would like to discuss your backyard outdoor fireplace or kitchen and would like to learn more about the DIY world we love so much, visit Backyard Flare. We can help make it a reality, saving you thousands of dollars. Give your backyard a face-lift and beautify your outdoor space. Thanks for reading and as always, happy building. You can do it!!! I remember receiving a phone call from Shelley who said she lived in New Jersey. Shelley explained to me that she was single, in her sixties, and that she lived on a piece of property that had a small creek running through it down the hill from her backyard. Shelley explained that she really wanted an outdoor fireplace but that she was super apprehensive about doing it herself. Because of the limited knowledge she had about masonry construction, Shelley was concerned with her age and ability to do the physical labor. I asked her some questions about her ability to lift and explained what the project would require. We talked it through, and by the end, Shelley was ready to take on the challenge. 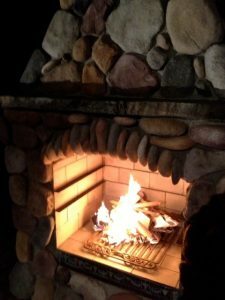 A DIY outdoor fireplace does not have to be intimidating or seem out of the realm of possibility if you have the right tools, preparation, and a good plan. A construction plan that is…something that will take the guess work out of the project. 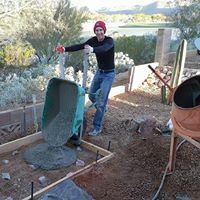 If you are physically able to lift a 60-pound bag of mortar, or if you have someone who can do it for you, that’s the first step. If you’re willing to step into a work site with an open mind, then you too can do what Shelley did. Talk about charming. This backyard patio was transformed into a great sitting destination. 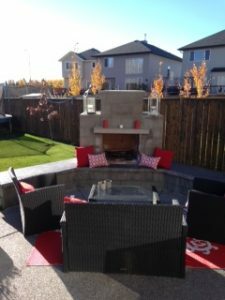 Shelley built her very own DIY outdoor fireplace and although it was small, it made a huge impact in her backyard and it is definitely a focal point. Do you agree, and do you think you want to join the DIY world? She had us do some special design work to make the fireplace what she wanted. We angled the chimney on all sides and designed the firebox to be low on the structure, which gave it a neat look. 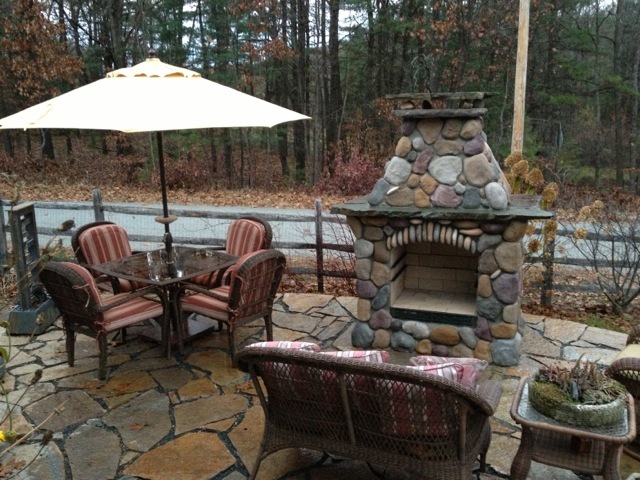 The fireplace sits on the edge of the patio with the treeline in the background. After building the structure, Shelley said that she took her time and didn’t push hard to get it done quickly. She said that if she could do it in her sixties, then anyone could do it. This is a testament that most people have the capability to do more than they truly think. There is an inner construction worker in most of us. Give your insecurities to us and let us provide you with a DIY construction plan. 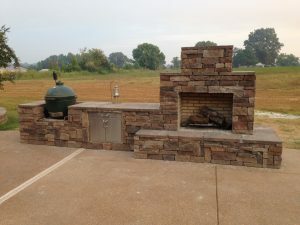 If you follow it, you to will be able to build a beautiful outdoor fireplace just like Shelley did. Shelley built her first fire and started making memories. 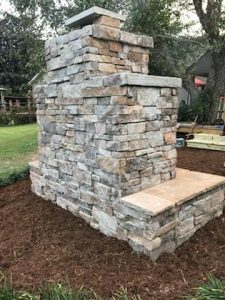 If you are wanting to learn more about the process of building a DIY outdoor fireplace, visit us online at Backyard Flare. We know that you can do it and that we can help. A construction plan may be exactly what you need to overcome the fear of building so you can DIY too. Thanks so much for reading and we hope to hear from you soon. Leave a comment and let us know if you think you’re up for a DIY project. An uncluttered and clean backyard is a welcoming backyard. Okay, I’m going to get right into it today. Not need to beat around the bush here. Your backyard…and mine…needs help probably. Your backyard might be old, dated, tired, messy, and it needs a little “pick me up”, so why not get started? There are quite a few things that you can do that will make a HUGE difference and at the same time not break the bank. Here are 3 ways to improve the look of your backyard. First, pick up the clutter. If you’re like most of us, you have odds and ends laying around. You may have a section of your yard that is dedicated to compiling the old car parts or the old bikes that haven’t been ridden in years. Chances are that if you haven’t needed them in the past year (or five) you won’t need them at all in the future. Collect them and put them on Craigslist so you can make a few bucks too. Just cleaning up a cluttered corner will make a huge difference. A clean backyard draws you in for an extended stay. Second, sweep up the patio or deck area of your yard and then look up. Are there spider webs hanging around the lighting fixtures or the underside of the patio cover? Take down those spider houses with a broom and make a change up high. Get a hose or high pressure sprayer and clean up the whole area that is attached to the house. This includes patios, brick work, decks, patio covers, and even the back of the house itself. You’ll be amazed at how much dirt your house holds onto. A quick wash down may bring the color back to your home’s exterior too. Cleaning low and high will make it look more inviting. Lastly, pick the weeds growing in your flowers and trim your bushes and trees. The branches and clippings will usually take a while to get rid of if your garbage can isn’t big enough to handle a lot, but the yard will sure open up. Getting rid of low hanging branches and unwanted ground plants will make an immediate positive impact on the overall look of the yard. The best part is that these three de-clutter and cleaning tasks are virtually free to do. They shouldn’t cost you any money, just a little time and sweat equity. 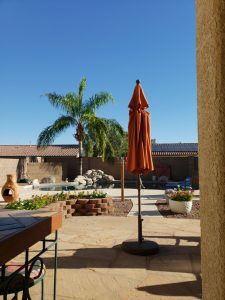 In the end, you’ll have a nicer, cleaner, and more welcoming backyard area. Who knows, your clean backyard may go on to inspire other projects. Start small and work your way up to a finished backyard sporting an outdoor fireplace or outdoor kitchen. You’ll love it in the end and you’ll marvel at the hidden gem that was under all that dirt and clutter. 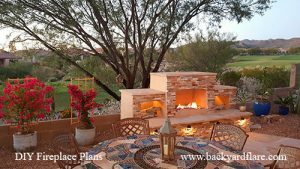 If you are interested in any construction plans for an outdoor fireplace or an outdoor kitchen, look no further than Backyard Flare. We specialize in easy to follow DIY construction plans that will take virtually all the guess work out of the build. Follow the plans, finish the structure, and begin relaxing in your backyard. 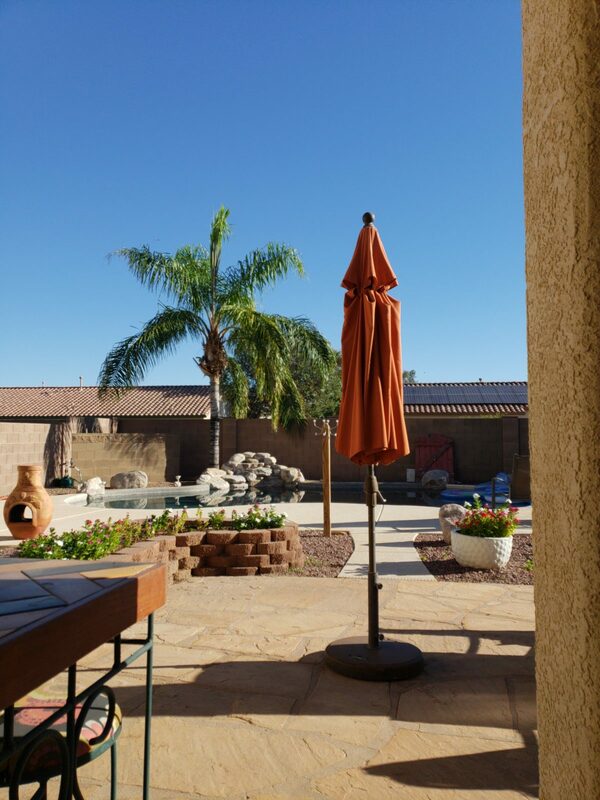 Call or text Dan at 520-269-9740 or email him at dan@backyardflare.com for additional info, special deals, and some fun discussion. As always, have fun and remember, happy building. How Much $$$ Can Be Saved? Backyard Flare is dedicated to helping our customers. We want you to have as much information as possible before you step into a backyard addition. We want you to understand backyard renovation pricing. 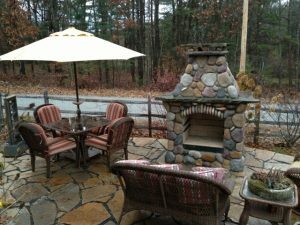 One question I get quite often from inquisitive DIYers is how much money can be saved by not using a contractor to build an outdoor fireplace. With this question, there is no “one” answer and the savings, albeit a guarantee, cannot be exactly quantified. There are costs that will be a surety, such as labor, but each contractor bills a little bit different. There is no exact savings amount, other than saying a lot, unless you have an itemized quote from a contractor that you then compare to what you will spend. Now let’s break this down a step further. Most contractors do an excellent job and I believe you will get your fireplace built if you choose to go the route of a contractor to get it done. I can’t step on the back-breaking work that they perform day in and day out. It’s a tiring business for sure and they definitely deserve a pat on the back and some kudos. Having said that, you may be wondering about how contractors bill for jobs. If you have elicited the work of a contractor for anything in the past, you will notice that some will give you a written estimate and others will come over and throw a monetary figure at you after looking at the building area for a few minutes. A written estimate is better for you, provided it is broken down into independent materials and labor costs. This will tell you roughly what they think the materials will cost with their slight mark up. Most contractors will make a few dollars on materials as well, with the understanding that they had to go load them, deliver them, and then unload them at your worksite. It’s a lot of work so it’s an okay upcharge, I guess. The contractors that throw out a price with no explanation of materials and labor make me smile. These contractors are betting that you will jump at the offer and that you won’t throw up any objection. Long and short, they don’t want you to know the breakdown of the profit they are making. It’s okay to haggle and negotiate too. Remember, this is your backyard, and they will be working for you. You dictate whether they leave each day with trash all over the place and you will be watching them while they finish the build. These two quotation methods from contractors drastically differ but both are widely used. Some that don’t write the job estimate are good at what they do and will provide a breakdown if asked to. Just remember that you will probably be a bit shocked at how much contractors will charge for labor. It will make up the majority of the quote. It’s a good living for company owners, believe me on that one. So, you have an option. Either go with a contractor or elect to try to build the fireplace with your own two hands. This is where the music is queued, and we emerge at the top of a hill with a DIY construction plan. We swoop down to your backyard and hand it to you, and then we stand off to the side, waiting for questions while you build. The trailer for the movie seems so awesome, but deep down we know that the movie will probably never be made. I guess we’ll stick to creating the construction plans and to our design work. Enough already… we have more explanation to get back to. When you build yourself, the labor that contractors charge won’t be an issue. There won’t be a subtraction from your bank account for labor as you’ll be the labor force behind the entire build. This shouldn’t scare you either. We have had a lot of customers who have done amazing at building their own fireplaces and they have never worked with mortar or block. 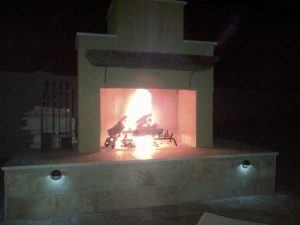 Jason’s DIY Pima II outdoor fireplace is built and ready to go. We’re so happy that Jason had a great experience and that’s an amazing savings of at least $5,200. That’s a lot of money still in Jason’s bank account and the best part is it sounds like he really had a good time with his dad while building the fireplace. 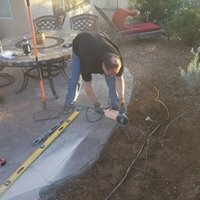 Backyard renovation pricing wasn’t a big deal to Jason because he opted to save the money and pay sweat equity instead. 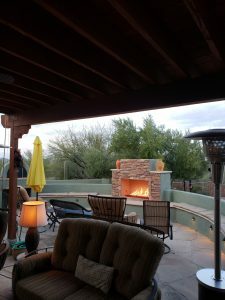 Jason’s DIY Pima II outdoor fireplace is so inviting with a gorgeous fire. Think about that when you contemplate your options. Building your own DIY outdoor fireplace doesn’t have to be stressful or worrisome. We have what you need to walk you through the process of a DIY outdoor fireplace. 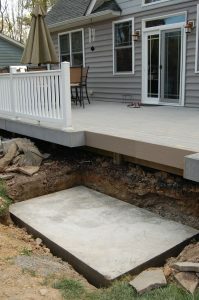 Visit us at www.backyardflare.com for great design ideas and information. We can help you with a great layout and will work with you personally to ensure you have the information you need to comfortably move forward in the DIY construction world. Build with one of our DIY construction plans and let us worry about the logistics of the design. You simply have fun and marvel at what your hard work. Thank you so much for reading and as always… happy building. Relaxing by the DIY gas fireplace during a dinner party. The other day, my wife and I attended a dinner party at the home of a previous fireplace and pizza oven customer. 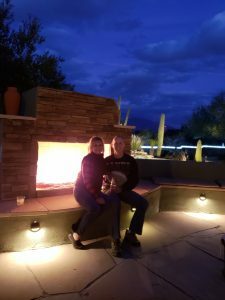 We were able to spend some time outside enjoying the fireplace and just the awesomeness of the backyard. Homeowner Tom helped me build this structure, so this is technically a DIY build in a sense. Tom learned a lot and he was able to add lots of great value while we had a blast constructing his masterpiece. What an amazing and welcoming space in this backyard. There is so much to his fireplace and pizza oven structure. To get started, the whole circular structure is a whopping 31 feet in diameter. It’s massive to say the least. It surrounds a seven-foot-wide natural gas fireplace. Inside the four-foot-wide firebox is an “H” pipe covered with bright red fire glass. The fire glass color is great because, if you look closely at the picture, it turns blueish purple when it heats up. Such a great look. Fireplace is 7′ wide with the gas “H” pipe covered in red fire glass. The front of the fireplace is covered with a great stone veneer and the remainder of the structure was stuccoed to match the texture on Tom’s house. The seating is all smoothed flagstone cut to match the curvature of the seat back wall. On the hearth, there are several low voltage lights that add that extra something. It looks amazing every night, whether there is a fire blazing away or not. What an amazing backyard for parties and even some quiet time. The left side of the structure holds the pizza oven built around a BrickWood Ovens DIY mold. It didn’t get any easier than that mold to build around and then wait until the mortar cured. 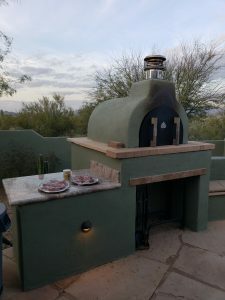 The pizza oven is covered in stucco that is painted the same color as the rest of the structure. To the left side of the pizza oven, we added a piece of polished granite, so Tom could roll out his pizza dough and prepare his pizzas. No need to run into the house every time, the counter is right there. Seeing how much Tom and his family has used the fireplace and pizza oven makes me smile that they are building lots of great memories. The parties with family and friends are a lot of fun and the quiet nights in front of the fire are special for them too. Conversation and drinks around the DIY outdoor gas fireplace. The view of the Tucson valley from this backyard is amazing. If the idea of a fireplace and pizza oven sounds like something you would want to step into, there is a great place to go, Backyard Flare. You can look through the great design ideas and also figure out what you want in your backyard. Big or small, every fireplace structure looks great. We want you to begin living in your backyard again. What better way to start than by building your own fireplace and pizza oven? If you have any questions about anything, please let me know. I am always excited to hear from a fellow DIYer, or someone wanting to learn. You can certainly do it yourself and beautify your backyard space. I can be reached at dan@backyardflare.com and as I always say, “Happy Building”. 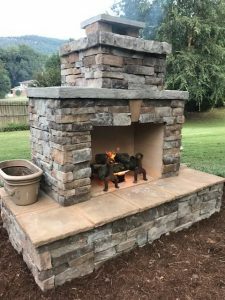 Welcome back my fellow DIY’ers and welcome to this edition of, “That Awesome DIY Fireplace” where we introduce a DIY homeowner, tell you what state they reside in, and show you how awesome they were at building their own outdoor fireplace. This one is awesome to say the least. Let’s go to the southeast, beautiful Georgia to be precise, to introduce homeowner John. John had a bare space out his backdoor that needed a little sprucing up. 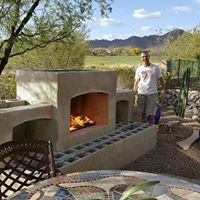 After checking out the construction plans at www.backyardflare.com, John decided to build the Pima II outdoor fireplace, and he purchased the plans. Getting ready to pour a concrete slab for the outdoor fireplace. John had to clear a grassy area to get ready for the footprint slab to be poured. Once he mapped out the positioning of the fireplace, John excavated the area and did his ground prep. 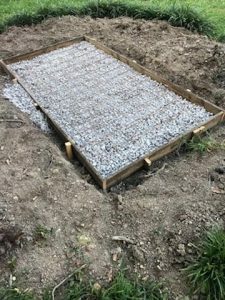 John built a wooden frame and added gravel and steel beneath the concrete. 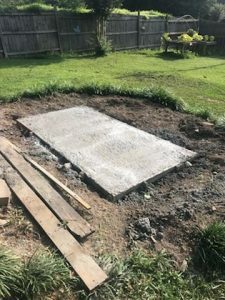 After pouring the concrete, he removed the wood, and he had his footprint slab ready for some mortar and block to be stacked. Concrete slab is ready for cinder block. 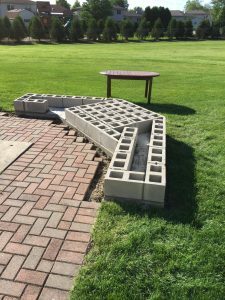 John spent the next few days building the cinder block structure, following the construction plans to a tee. John paid attention to detail with the mortar gaps and even though he hadn’t done much block work, he built beautifully. First row of cinder blocks are down. Firebox was established for John’s DIY outdoor fireplace. When John was getting the cinder block structure finished he began thinking about his finish material. 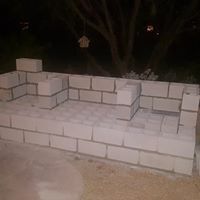 John added his firebrick to the inside of the firebox without mortar gaps between them. He took the recommendation of Backyard Flare and used high heat construction adhesive to adhere the firebrick to the firebox walls. The work site was super busy with lots going on. Veneer was like a jigsaw puzzle, finding the perfect piece for each spot. John finished with his fireplace and he cleaned up the work site. Anticipation for the first fire! John picked out a great veneer with a dark tone. The chimney and hearth portions were covered first, with the keystone added just above the firebox, centered. The seating material was adhered to the top of the hearth with matching grout, before the center section of the fireplace was covered with veneer. The mantel was stuccoed for texture and the top of the chimney was adorned with a very cool cap stone. John added veneer to the whole structure giving it a really nice 360 degree look. It looks amazing from all angles. Dark colored mulch was spread all the way around the fireplace and up to the edge of the very green grass. Two planters were added to the sides of the structure, which will probably have great looking flowers in them someday. John’s first fire in his DIY outdoor fireplace. He is so proud that he did it himself. John bought a very decorative fire grate and added a few logs to it in anticipation of his first burn. Oh, and what a beautiful sight it was when John started his first blaze. He was so excited to share these pictures because he wanted to show off his DIY labor and show that it was possible to build it yourself. Want to Build A Fireplace of Your Own? 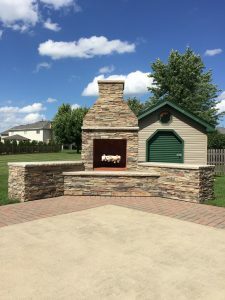 We sure hope you like John’s fireplace and that it inspires you to think about one of these fireplaces in your backyard as well. It’s really not out of reach to achieve a stunning outdoor living space. John believes that if he can do it, anyone can do it. If you have the DIY mindset, we can help you achieve greatness. We have assisted hundreds of homeowners who are weekend DIY’ers, realize their potential to build fireplaces just like John’s, so you can do it too. Visit Backyard Flare to learn more so you can begin your journey too. Thanks so much for reading about another great DIY fireplace build. We’ll bring you more soon, and as always …happy building. 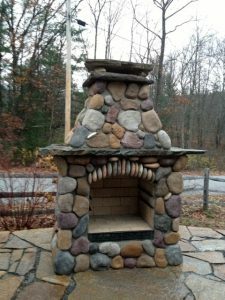 Hello all you DIY’ers and welcome to this edition of, “That Awesome DIY Fireplace” where we introduce a DIY homeowner, tell you what state they reside in, and show you how awesome they were at building their own outdoor fireplace. We’re going to see a stunning outdoor gas fireplace in this article. 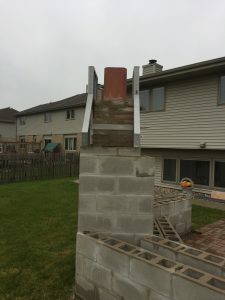 We venture down the street and across the tracks from Backyard Flare headquarters to introduce homeowner Jim, who wanted a short in stature outdoor gas fireplace. Jim specifically wanted to burn natural gas. Jim was restricted to natural gas and a short finished height by his homeowner’s association due to his home’s location on the golf course. Jim’s backyard was on the 12th tee so there is quite a view. Jim contacted Dan at Backyard Flare and explained his fireplace design and restrictions. No sweat at all for the Backyard Flare team. Dan did a couple site visits to Jim’s backyard and they came up with a plan of action. Dan was contracted to build the fireplace, but Jim was able to save a bit of money because he helped Dan through the process …and Jim learned a lot, very quickly. It’s always a blast when homeowners can help because they learn and have a great sense of accomplishment. After the fireplace location and width was determined, a diamond blade was used to cut through the existing flagstone patio. This area was excavated and framed for the concrete slab with rebar inside the pour. An inexpensive Harbor Freight cement mixer was used which made this job relatively quick for two people. Patio flagstone was cut to make way for the concrete slab. Dan is using a wheelbarrow to dump concrete into the wood form for the concrete slab. Once the concrete cured for a couple days, Dan and Jim started laying block in a running bond (staggered) pattern. The running bond pattern was used to build the structure. The firebox and storage voids were built with arched lintels made from concrete. The firebox in the middle was sandwiched between two wood storage voids on either side. An electrical line was routed through the blocks to install a 110v outlet. This outlet was used to plug in a power transformer for the structure and backyard ground low voltage lighting. The fireplace was covered in a stucco finish prior to the stone veneer being applied. A level was used as a straight edge to mark the cuts on the flagstone. When the structure block work was completed, firebrick was added to the inside of the firebox. The flagstone was added to all horizontal surfaces of the fireplace. The natural gas line was plumbed up the backside of the structure and a shutoff valve was added inline before it was installed into the back wall of the firebox. This gas line stubbed out a few inches inside the lower right corner of the firebox. Gas tubing was added to an H pipe and a few test burns were done before anything was solidified. The wire for the structure lighting was routed to the front of the hearth and to the inside of the storage voids, figuring out where each light would be located. The front face of the structure was adorned with a beautiful stacked stone, which was mortared in place. The remainder of the structure was covered in a smooth coat troweled stucco, which was later painted. The horizontal surfaces were covered in a gorgeous light tan flagstone which Dan and Jim cut with a chisel method for a rougher edge. This was a bit time consuming and much slower than a saw cut front edge, but completely worth it in the end. The finished fireplace sure makes a statement in this backyard. With the leftover flagstone, Jim extended the flagstone patio to the far-right side of the structure and filled the joints with matching mortar. After it was pressure washed, you can’t even tell where the old flagstone patio and the new came together. Totally amazing. 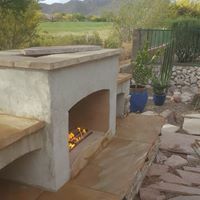 A vertical piece of flagstone was added to the front of the firebox after it was chiseled to resemble a mountain range in Jim’s home state of Colorado. This piece of stone helped contain the local river rock that was added to the top of the H pipe. This rock completely hid the pipe, making it look as if the flames “originated” from the rocks. For continuity in the backyard, the fireplace stucco was painted to match the house. New outdoor furniture was added to the patio and many nights have been spent eating, drinking, partying, and relaxing in the backyard. So many golfers stopped to see the fireplace and to offer kind words, complementing Jim on his design. With the ambiance of the lighting in the voids and quick start of the natural gas in the firebox, Jim and his wife have been able to say, “hey want to have a fire?”, and enjoy it in a matter of seconds. Easy on and easy off is what Jim wanted and it turned out great. This backyard was transformed with this fireplace overlooking the gorgeous golf course. You Ready to Build One? We sure hope you like it too, so let us know how this DIY fireplace inspired you? Are you ready to build your masterpiece like Jim did? Even though this outdoor gas fireplace included natural gas, low voltage lighting, and chiseled flagstone, it can all be done by you too. If you have the DIY mindset, we can help you achieve greatness. We have assisted hundreds of homeowners who are weekend DIY’ers, realize their potential to build fireplaces just like Jim’s. You can do it too. Visit Backyard Flare for more information and DIY construction plans. Thanks so much for reading about another great DIY outdoor gas fireplace build. We’ll bring you more soon, and as always …happy building. 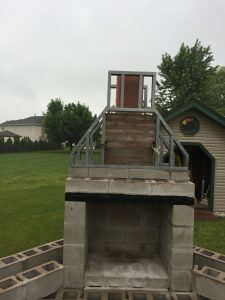 Hello all you DIY’ers and welcome to this edition of, “That Awesome DIY Fireplace” where we introduce a DIY homeowner, tell you what state they reside in, and show you how awesome they were at building their own outdoor fireplace. Who is Our DIY Builder? We venture to Illinois to introduce homeowner Mario, who decided to build the Douglas Mini design. Mario reached out to Backyard Flare and ordered his DIY construction plan. Mario started with the footprint on his concrete slab. Mario’s backyard has a great looking grassy area with a brick patio. The corner of the patio needed a new addition though, so an outdoor fireplace was the obvious choice. Mario started building his fireplace as per the construction plan and got to the top of the firebox lintel. Mario elected to make some modifications to the chimney portion of the build to give the top an angled look. Metal framework was added to create the angled chimney. To achieve these angles, Mario used metal stud for the framework, using small self-tapping screws to tie the metal sections together. It’s very important to make sure the angles are the same on each side. The metal framework was symmetrical on the front and back. Mario finished his fireplace with a beautiful stone veneer and natural stone horizontal surfaces. The firebox was finished in a red firebrick, providing a cool look. Mario bought a metal fire grate and it looks like a perfectly cut piece of aspen pine is laying there ready for a good burn. The brick patio was laid back down to the front of the hearth, giving it an almost seamless look. If you look closely, the angles of the chimney match the door on the shed behind it. I really think Mario did this on purpose to tie the backyard together. It really works, and we love it. Great Douglas Mini design outdoor fireplace built by a homeowner using a construction plan from Backyard Flare. How has this DIY fireplace inspired you? Are you ready to build your masterpiece like Mario did? Backyard Flare can help you with any worries or concerns of the masonry word, and even with design help. We have assisted hundreds of homeowners who are weekend DIY’ers, and we can help you realize your potential to build a fireplace just like Mario’s. You can do it too. Check back on our blog page periodically and follow us on Instagram and Facebook for additional photographs and information. We love to share great pictures and we really enjoy bragging about our customers, so we hope to hear from you. 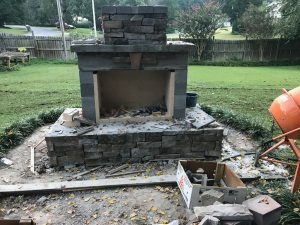 Hello all you DIY’ers and welcome to this edition of, “That Awesome DIY Fireplace” where we introduce a DIY homeowner, tell you what state they reside in, and show you how awesome they were at building their own outdoor fireplace. They do it all by themselves with a little help from us here at Backyard Flare. 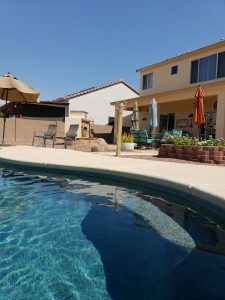 We venture not far from Backyard Flare headquarters in Arizona to introduce homeowner Jason. 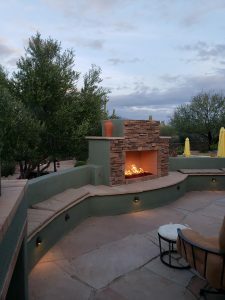 A DIY guy who decided to build the popular Pima II fireplace design using the proven Backyard Flare outdoor fireplace construction plan. Gorgeous Pima II outdoor fireplace built by Jason in AZ. 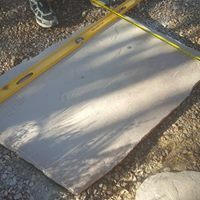 Jason has the traditional landscape rock in his yard as most of us do in southern Arizona. 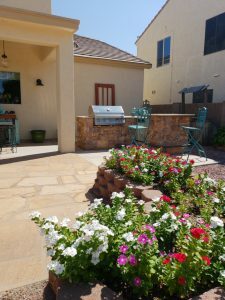 A stunning tile patio was built with a perimeter tile of the same type. The Pima II fireplace is built on a 45 degree angle to the patio. The fireplace measuring just wider than eight feet is a perfect addition to this space and with wrap-around seating, lots of horizontal surface is available. To keep continuity, Jason used the same tile for the patio to wrap up the hearth of the outdoor fireplace. This tile then extends to the horizontal seating surface, which gives it a great finished and well thought-out look. Jason added electrical line for low voltage lighting in the hearth, giving the fireplace a subtle look at night even when it’s not being used. This outdoor fireplace is backyard furniture for sure, providing a great focal point. For the main vertical firebox and chimney sections, Jason elected to use stucco as the finish material. In Arizona, as with many other states, this matches the home’s exterior, which also keeps the theme going throughout. With the texture and darker earth tone paint, it blends really nice with the natural desert landscape seen behind Jason’s block wall. The horizontal sections of the chimney and the top were covered with matching tile, which was saw cut with a diamond blade. Super simple by the way. When the sun goes to sleep, the lights come on and the fire burns. how beautiful. Jason wanted to add some pop, so he finished the front of his outdoor fireplace with a gorgeous piece of distressed wood for his mantel. Wanting to match other elements, Jason used metal brackets underneath the wood. These metal brackets match the metal fireplace tool set and the metal fire grate in the firebox. Jason got ready and stacked a pile of pine in the firebox, ready for a great nighttime burn. I’m sure the neighbors stare out their back doors at the glow from the chimney and they smell the sweet smell of burning pine. How has this outdoor fireplace inspired you? Are you ready to build your masterpiece like Jason did and transition your backyard space? Backyard Flare can help you with any worries or concerns of the masonry world, and even with design help. 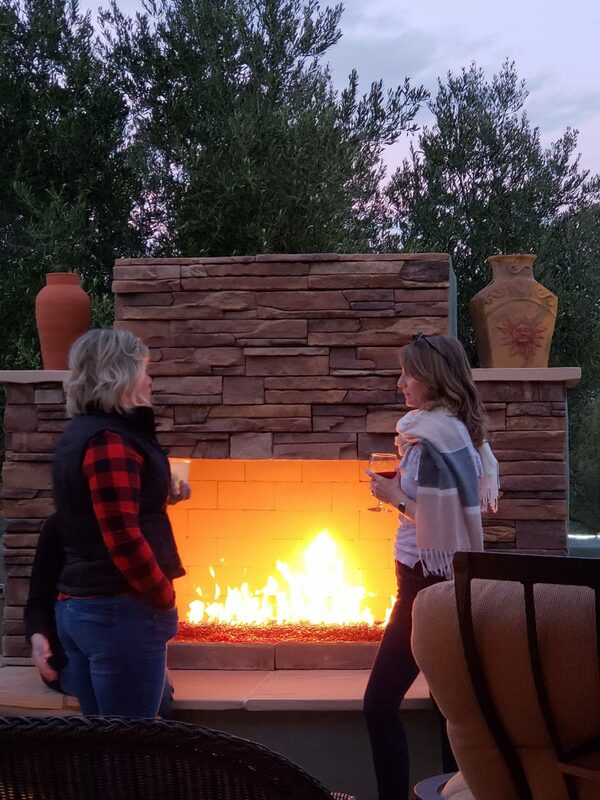 We have assisted hundreds of homeowners who are weekend DIY’ers, realize their potential to build outdoor fireplaces just like Jason’s, and you can do it too. 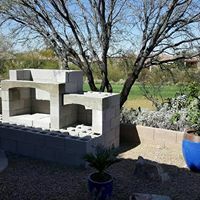 Thanks so much for reading about another great DIY outdoor fireplace build. We’ll bring you more soon, and as always …happy building. 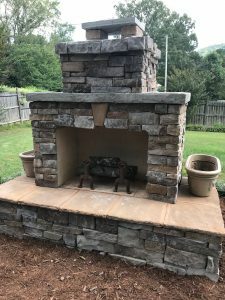 CAN I BUILD MY OWN DIY OUTDOOR FIREPLACE? Gorgeous light colored veneer and lighting make this a very cool DIY fireplace. 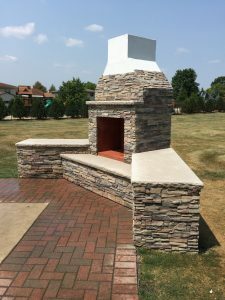 If you’ve gotten as far as thinking you want an outdoor backyard fireplace, then the next obvious thought should be on the construction method. To lay it out as simply as possible, either you build it yourself or a contractor builds it for you. And I’m not talking about a prefabricated fireplace where you stack a few pieces and have a fire an hour later. 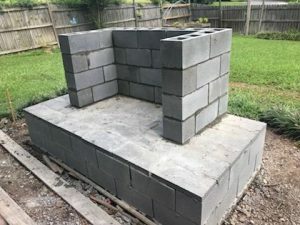 I’m talking about a permanent cinderblock structure with all the amenities such as seating, shelving, lighting, veneer, firewood storage, etc… Frankly a DIY outdoor fireplace can be built for cheap. Great DIY corner designed fireplace all decorated and ready for a party. When you elect to have someone else build your fireplace, you will pay for two specific things. They are materials and labor, the latter of which will be most of your cost. Is it easier to have someone else sweat while lifting block and splattering mortar? Absolutely, but you must then step back and look at the alternative. You! Have you given much thought to building your own fireplace? If the answer is no or even maybe, let me give you some things to mull over. Just one of them may sway you or the entire list may persuade you that a DIY project may be the way to go. First off, let’s look at the project as a whole. Building on a large scale with construction plans can be very enjoyable and rewarding. Think of it as stepping out on a new adventure with a lot of the guesswork taken out because of the plans you hold in your hand. Some of us have a small perfectionist attitude making it difficult to sit back and watch someone build something for us, knowing we would do it differently. I want to build to my taste; with my ideas in mind. Contractors, many times, provide building crews that are only interested in getting done in order to move on to the next project. In the end, it’s all about cash flow. Do they care about the final look of something they may never see again, but that you will have to look at everyday for quite some time? Maybe, however, I prefer complete control of my projects and how they’re built. That’s why I love DIY and that’s why I always try to persuade others to jump on the DIY train. It’s a fun train. It may seem small, but you also need to consider whether you will want contractor building crews in your backyard all day for the duration of your project. They always seem to show up too early or not at all. Then there’s the problem with the mess that is always left each day. 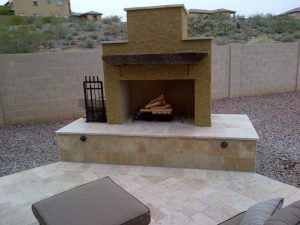 DIY Pima II fireplace with a great outdoor kitchen attached. When you build yourself, you control the pace of the project. Some DIY warriors can complete a fireplace project in as few as 9-10 days while still holding down a job. Others will spend a few weeks to construct their fireplace working only a couple hours here and there. When you build, it’s up to you how you structure your timeline. If the previous reasons haven’t convinced you to build your own fireplace then think about the money you could save by not soliciting the services of a contractor. As mentioned before, most of your cost with a contractor will be for labor. It is estimated that you can take the total cost of your materials and multiply it by 5-6 to give you an approximate labor cost. With this example, if you were to spend a total of $1,000 for materials, then the labor could cost as much as $5,000-$6,000, for a grand total of $6,000-$7,000 for a completed fireplace. That’s expensive! Not only are you paying for labor, but at times the contractor will make money on materials too. In other words, they will charge you more for each block than what it will cost for you to go to your own home improvement store to buy them. You’ll only know that though if they provide you with an itemized list of materials and labor broken down. Nothing is set in stone with how fireplaces have to be built, or even how much you have to pay. The truth is, however, that you will save money if you step out on faith and build your own outdoor fireplace. 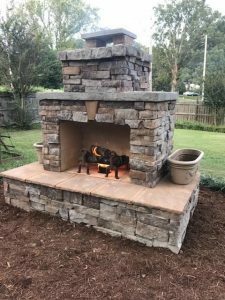 Think about how you’ll feel when you finish your own DIY outdoor fireplace project, knowing that you could have spent so much more. 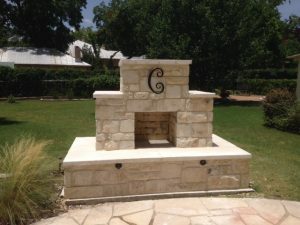 If you’re looking for assistance in the form of DIY outdoor fireplace construction plans, please visit Backyard Flare, LLC at www.backyardflare.com. We have many fireplace designs that we’re sure would look great in your outdoor living space. We would love the opportunity to work with you to make your backyard the talk of the neighborhood. We’ll give you the knowledge needed and be there for you along the way. Thank you for reading and we hope to hear from you. As we always say …happy building. 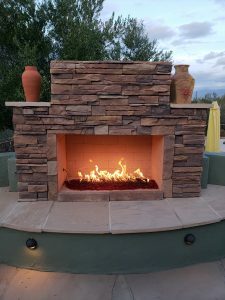 Please follow us on Instagram and Facebook, as we have lots of cool DIY outdoor fireplace photos and videos added almost every day. Contact Dan with any questions.